Family of printers at Venice. After the decline of the Bomberg printing-press a fierce rivalry grew up at Venice among the patrician families who wished to profit by printing Hebrew books. Among these, two distinguished themselves by the bitterness of their struggles, the Bragadini and the Giustiniani. The first of the Bragadini to engage in the trade was Aloisio I. Among the consequences of their rivalries were the denunciation of the Talmud and the confiscation of many Hebrew books in 1553. 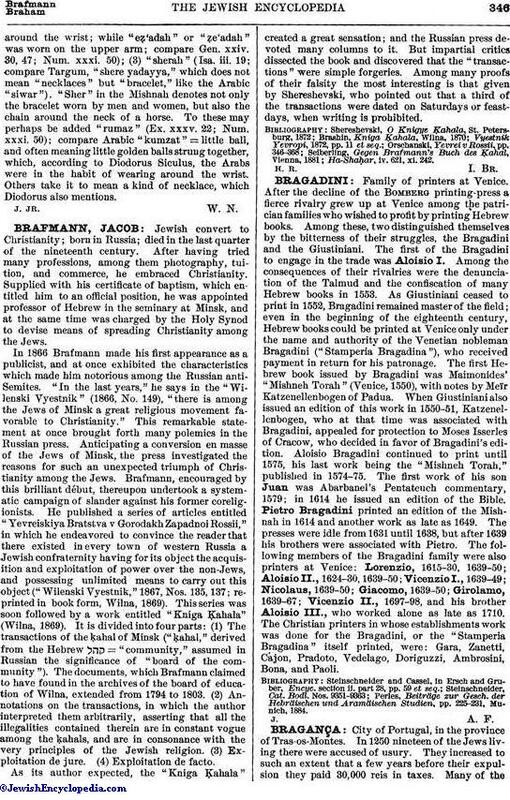 As Giustiniani ceased to print in 1552, Bragadini remained master of the field; even in the beginning of the eighteenth century, Hebrew books could be printed at Venice only under the name and authority of the Venetian nobleman Bragadini ("Stamperia Bragadina"), who received payment in return for his patronage. The first Hebrew book issued by Bragadini was Maimonides' "Mishneh Torah" (Venice, 1550), with notes by Meïr Katzenellenbogen of Padua. When Giustiniani also issued an edition of this work in 1550-51, Katzenellenbogen, who at that time was associated with Bragadini, appealed for protection to Moses Isserles of Cracow, who decided in favor of Bragadini's edition. Aloisio Bragadini continued to print until 1575, his last work being the "Mishneh Torah," published in 1574-75. The first work of his son Juan was Abarbanel's Pentateuch commentary, 1579; in 1614 he issued an edition of the Bible. Pietro Bragadini printed an edition of the Mishnah in 1614 and another work as late as 1649. The presses were idle from 1631 until 1638, but after 1639 his brothers were associated with Pietro. The following members of the Bragadini family were also printers at Venice: Lorenzio, 1615-30, 1639-50; Aloisio II., 1624-30, 1639-50; Vicenzio I., 1639-49; Nicolaus, 1639-50; Giacomo, 1639-50; Girolamo, 1639-67; Vicenzio II., 1697-98, and his brother Aloisio III., who worked alone as late as 1710. The Christian printers in whose establishments work was done for the Bragadini, or the "Stamperia Bragadina" itself printed, were: Gara, Zanetti, Cajon, Pradoto, Vedelago, Doriguzzi, Ambrosini, Bona, and Paoli. Perles, Beiträge zur Gesch. der Hebräischen und Aramäischen Studien, pp. 225-231, Munich, 1884.